He's back, and he's hungry. 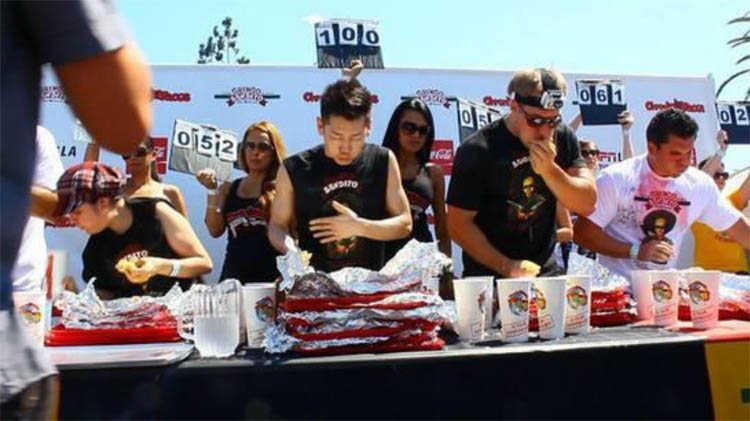 Competitive-eating legend Takeru Kobayashi returns as a competitor in the Gringo Bandito Chronic Tacos Challenge, happening this Sunday at the US Open of Surfing in Huntington Beach. Last year, Kobayashi broke the world record by scarfing down 106 tacos in 10 minutes. The year before that, he devoured 81. Will he reign again? Or will he be dethroned by Furious Pete? Will someone spew? We'll have to wait and find out. The annual taco-eating contest was created by Dexter Holland, Offspring frontman and founder of the Gringo Bandito line of hot sauces. Check it out on the US Open of Surfing main stage at 3 p.m.